We are happy to announce that CouchWarriors will be hosting a special qualifier tournament for the DEAD OR ALIVE FESTIVAL. This is a special exhibition tournament taking place in Tokyo, Japan on August 1, 2015. We are honored to partner with Team Ninja to create this opportunity for Australian fighters, and to host the tournament at OzComicCon. The winner of this tournament will be awarded with a qualified spot in the Festival along with flights and accommodation in Tokyo for the event! MINDSCAPE, TEAM NINJA, TECMO KOEI: #BAM7 Sponsors! We are proud to announce TEAM NINJA, along with Tecmo Koei Europe and Australian Distributor Mindscape, are supporting Battle Arena Melbourne 7! Team Ninja are the developer of DEAD OR ALIVE 5 LAST ROUND, which will see Australia’s very best fighting it out in the tournament on Sunday 24th. International guest PERFECT LEGEND will be participating in the DOA5LR tournament. Winner of EVO in 2006 for DOA, Perfect Legend remains a big supporter of the game. You can see him explaining the tutorial mode of the game here. Special Preview – Dead Or Alive 5 Last Round (PS4) Playable at this Sunday’s Ranbat! Play the next gen version on PS4 this Weekend! That’s right, you’ll be able to play the new version of Dead or Alive 5 on PS4 ahead of its release in 2015! Make sure you head to the December Ranking Battle Finals this Sunday 14th and you can be among the first to play the next generation edition of the 3D fighter. Featuring two new characters, new stages and environment effects, this looks to build on the solid work put in on DOA5 Ultimate. Plus, Mindscape Games are giving away copies of Dead or Alive 5 Ultimate, the DOA soundtrack, and Kasumi mousepads. There’s been a good run of tournaments for DOA5U this year at Ranking Battles, with a Ranking Season Medal Winner to be decided this Sunday. Join the Dead or Alive Australian Community on Facebook. Players are regularly setting up games online and sharing news and info. Follow Tecmo Koei distributor Mindscape Games on Facebook and Twitter, and Team Ninja’s official Dead or Alive Facebook Page. MINDSCAPE, TEAM NINJA, TECMO KOEI: #BAM6 Sponsors! We are proud to announce TEAM NINJA, along with Tecmo Koei Europe and Australian Distributor Mindscape, are supporting Battle Arena Melbourne 6! Team Ninja are the developer of DEAD OR ALIVE 5 ULTIMATE, which will see Australia’s very best fighting it out in the tournament on Saturday 10th. Local distributor Mindscape Australia have offered a round of Tecmo Koei games and special items, while Team Ninja have supplied the brand new DOA5U character Marie Rose as DLC for event participants and for giveaway to stream viewers! PLUS x10 Download codes direct from Team Ninja for the new character Marie Rose! 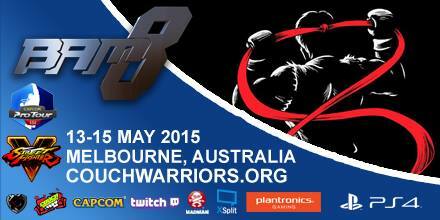 Many thanks to TEAM NINJA, Tecmo Koei and Mindscape for their support of Battle Arena Melbourne!